AG ActiveSync Filter is a solution for controlling who and what to Sync when users connect to Exchange server with mobile devices. More and more companies encourage their employees to work with their mobile devices implementing Bring Your Own (BYO) strategy to save money and improve efficiency.But from a security point of view, mobile smart phones are in fact mini computers and should be treated from a security aspect as a potential threat. The ActiveSync protector supports both Access Control and Content Filtering. It can verify that user and phone match-up and limit the content exiting the network to the minimum required and to workers truly requiring it by defining rule-based content filtering.No client installation - easy to deploy and cross-platform support. SecurityGateway Email Spam Firewall for Exchange/SMTP Servers provides affordable inbound and outbound email security with a powerful spam filter that serves as a Microsoft Exchange or SMTP firewall. Its multiple analysis tools separate threats from legitimate email, while leveraging proven anti-spam, anti-virus, anti-phishing, and anti-spoofing technologies to produce a 99% spam blocking rate and achieve nearly zero false-positive results. 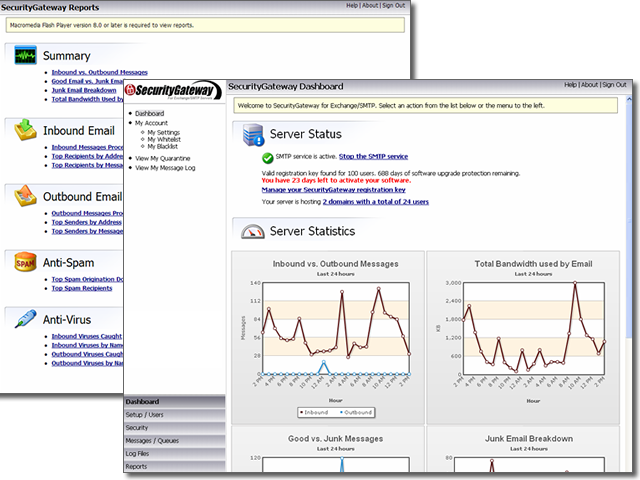 SecurityGateway Email Spam Firewall for Exchange/SMTP Servers features simple administration using an intuitive, task-oriented interface and offers comprehensive reporting that identifies email traffic patterns and potential problems. Its powerful filtering engine is based on the industry standard SIEVE mail filtering language and its Defense Layer Customization can prioritize operations a specific security rule will execute when analyzing incoming or outgoing mail traffic. Simple Administration, Powerful Filtering, Accurate Results! Encrypt and digitally signs files, folders, emails. Securely delete them beyond recovery. Store and share information securely, including communications with PGP and other OpenPGP systems without the usual complexity. FA OpenPGP has the latest Government grade security and uses full strength PKI technology to protect your information. DynaComm i:mail is an e-mail content security solution that enables you to monitor and filter e-mail traffic in order to protect your organization from virus attack, bandwidth wastage, spam overload and proprietary information loss. DynaComm i:mail features flexible rules that enable you to effectively manage your organization's e-mail traffic. Customizable and extensive keyword content means that spam is identified and that e-mail is accurately categorized. Comprehensive reporting provides you with a detailed picture of e-mail activity and usage within your organization. SpamLion is a server-based, anti-spam solution that uses a Patent-pending "White List" technology to stop the spam that is currently destined to be delivered to your corporate mailbox. White List technology means that there are no content filters or Black Lists to subscribe to or maintain. User access to Quarantine Management as well as Administrative Management is web-based. There is no client software to install or maintain. SpamLion is installed on a dedicated Windows 2000 server or Windows 2000 Professional computer located between your mail server and the Internet. Removes all types of e-mail threats before they affect your network. Mailwall will protect your mail domain by receiving inbound mail first, checking it and forwarding it to your mailserver. Outbound mail can also be configured to be received by Mailwall from your mail server and delivered by Mailwall after checking it. Mailwall intercepts all e-mail messages on your network, disassembles them and looks for undesired/illicit content and threats in your e-mail: SPAM exploits, macro viruses and malicious HTML code. All policies are rules based - you can automatically filter, delete or quarantine suspicious messages. Works with all mail servers and does not require changes in setup for your existing e-mail users. You should either install Mailwall on a seperate machine or reconfigure your mail server to release port 25 for Mailwall. added image categorisaton system, improved POP3 server module,added Manager module to aid automatic recovery,added option to organise Quarantine by date,improved Queue Manager with message search facility,added support for modyfing message subject,added logging, blacklist and imagecat databases to standard distribution,updated default list of blacklists for better spam detection,all valid message recipients are excluded from future spam checks. The GROUP securiQ Suite is a comprehensive security suite for Microsoft Exchange and Lotus Notes/Domino. It covers all aspects of e-mail security including content filtering, liability protection, virus protection, e-mail recording, encryption, and more. ModusMail is a complete e-mail server with advanced security features. It receives, delivers and sends e-mail and filters it to avoid spam, viruses, blacklisted senders and forbidden attachments. ModusMail relies on the Modus3 engine to perform multi-layered scanning of the e-mail flow. Its architecture allows for optimal performance by letting multiple layers discard or process e-mail, thus preserving precious CPU power for performance-intensive scanning of more complex forms of spam and legitimate e-mails.